Further Comments: The phantom white woman is said to make her way from the nearby church to a door on the east side of the hall. Further Comments: A woman in white is said to appear at midnight, sit for awhile, and move off to a nearby stream to drink. Further Comments: Seen by two lay preachers driving a horse and trap, this phantom was mistaken for a real woman as she walked towards them in the rain. They could see she had auburn hair and a beautiful face, before she vanished without trace. Further Comments: Dying in childbirth, this mistress of a former owner still walks the walls. 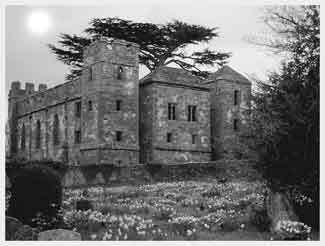 The ghost, or perhaps another, was seen in 1970 as it crossed the road outside the hall; the driver of a car drove straight through the figure. In October 2012, one team of ghost hunters recorded laughter in the stable when the area was empty - the area is reputed to be the location where a serving girl hanged herself - while another team in September spotted a black dog. Further Comments: During a fashion shoot in this former prison, studio photographer Alan Wells caught a strange white female apparition in the background of one of his images. Further Comments: The phantom white lady here was reportedly seen by soldiers using the building during the Second World War, and was thought to be the murdered wife of a former owner. Within the manor she would ascend the staircase holding a candle, while one person who observed her outside said she had no feet and had drifted across a nearby field. The kitchen area was also reputedly haunted by a ghostly monk. Further Comments: A local story says that the woman in white was hanged over Washer's Pit, but was saved by a washer woman. This has not prevented the white woman's ghost now haunting the area, where she is said to have been seen. Further Comments: This pallid person drifts around the grounds of the manor and sometimes the stones, her face covered by a large hood. 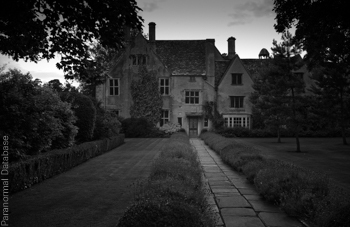 The manor house itself is said to be haunted by several entities. One spirit which would scatter rose petals across the floor of the Crimson Room, a phantom monk was spotted in the library, and a ghostly Cavalier sometimes makes an appearance. Further Comments: A government worker walking from Avebury Manor reported encountering a ghostly woman in white lace and a white hood at a iron gate close to Truslow. The witness said the woman appeared from nowhere, took his shoulders, and spun him around before pushing him away. Date / Time: Late twentieth century, though sightings go back to eighteen century? Further Comments: While the clothing of the woman varies (from wearing a raincoat to a wedding dress), the figure is always white. In true 'phantom hitchhiker' style, the woman had been picked up by passing drivers, only to vanish a few miles down the road. Further Comments: The White Lady has been observed looking into each pit, crying out in pity. Her origin is unknown, but could be one created by local smugglers. The sound of the screams heard in the pits, though local custom blames the wright of the woman, many reason to be the wind. Further Comments: A lady in white haunts this field, while the road nearby is home to a phantom dog.